Space shuttle Discovery is on launchpad 39A, ready and waiting for tomorrow afternoon's launch. Inside the cargo bay a 7th astronaut is also waiting, already strapped in, and ready to make spaceflight history. 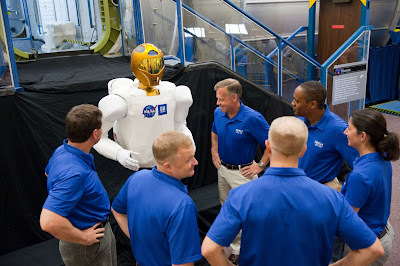 After tomorrow's launch, Robonaut 2 - 'R2' for short - will be the first-ever humanoid robot in space. R2 was designed as a prototype and not originally scheduled to go up into space but when he was revealed in February (I'll reference R2 as a 'he' since I've never seen a woman quite so burly as he), NASA was so impressed that they made room for him on the second to last shuttle flight. Though he'll be restricted to staying inside the International Space Station (ISS) for now, R2 had to be hastily redesigned to withstand the harsh environment of space and also modified to meet requirements for those living aboard the ISS. R2's processors were upgraded to increase his tolerance for radiation - a persistent threat to any human or machine operating in space. His original skin was replaced with non-flammable materials and he was given extra shielding to reduce electromagnetic interference. Quieter fans were installed to keep the robot within the ISS's noise requirements and his power system was rewired to work with the station's direct current power supply rather than the alternating current used on Earth. 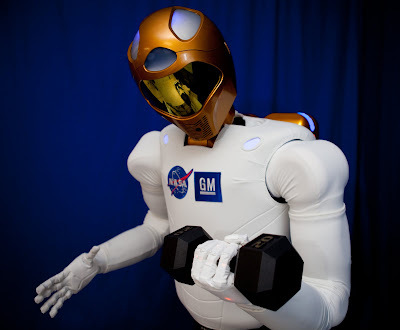 In 2007, General Motors partnered with NASA to develop R2 in hopes that the new robot design would benefit both manned spaceflight and auto manufacturing plants. Though the robot's nickname, R2, brings to mind a certain trashcan-shaped droid, the machine looks more like a legless Boba Fett than Luke Skywalker's rolling sidekick. He weighs over 300 pounds, has an 8 foot wingspan and senses depth through an infrared camera mounted in his mouth. He thinks with his stomach (cameras are mounted behind his visor to enable him to see so his 'brains' were housed in his torso) and can hold up to 20 pounds in his arms. For now, R2 will be restricted to the Destiny laboratory where he will undergo tests to see how he reacts to space. 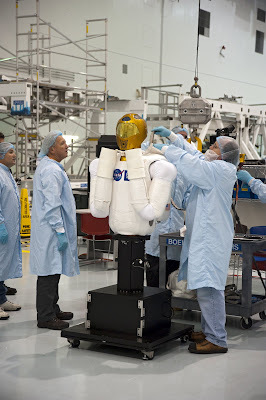 Once engineers see how R2 functions in orbit, he can then get hardware and software upgrades (including legs!) to enable him to work outside in the vacuum of space. Ultimately, learning how to beef up R2 to better withstand the constant onslaught from solar flares and cosmic radiation could enable similar robots to survive long-term spaceflight either in earth's orbit, where they can repair and maintain satellites, or on long journeys through deep space. "This project exemplifies the promise that a future generation of robots can have both in space and on Earth, not as replacements for humans but as companions that can carry out key supporting roles," John Olson, director of the Directorate Integration Office in the Exploration Systems Mission Directorate at NASA Headquarters said in a NASA press release. "The combined potential of humans and robots is a perfect example of the sum equaling more than the parts." To watch the launch of STS-133 live, click here for streaming NASA TV. i want know about dark energy and its effect in universe. It seems funny that we can send a robot into space, but still use manual signs to announce launch dates!